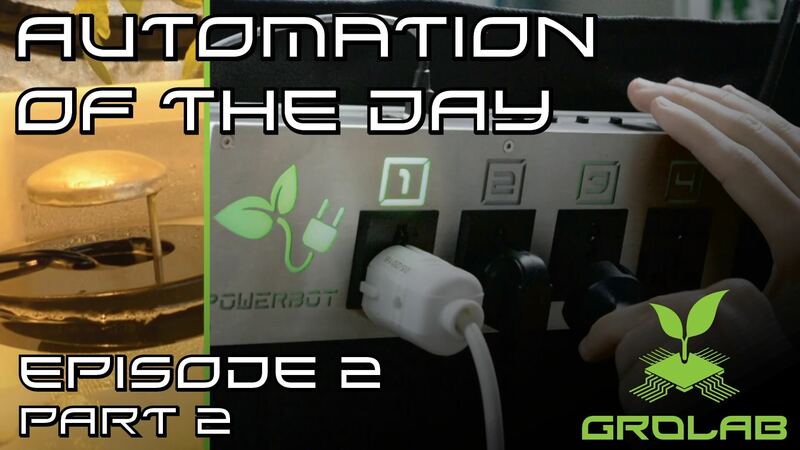 GroLab™ Automation of the Day – How to Control the Humidity from your Growing Area? Welcome to another post of GroLab™ Automation Series! These videos take you on a guided tour of all the GroLab™ functionalities. If you want to see more, check out our YouTube channel or keep following our blog. In this second part of the second episode we will talk all about the climate and humidity of your grow, as well as explain you how to automate your humidifier and create alarms to adjust the humidity💧 for whatever values you may need. 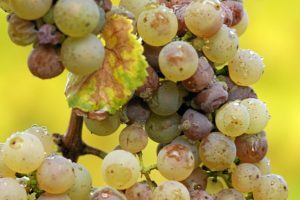 What influences the climate of a growing area? Today we will be talking about the importance of having a good control over the humidity in your growing area in order to help your plants to thrive and especially avoid mold on your grow. Let’s first differentiate Humidity (or Absolute Humidity) from Relative Humidity. Absolute Humidity is the amount of water vapor or moisture in the air. It is measured as grams of water per cubic meter of air. Relative Humidity is also a measure of water in the air, but relative to the air temperature. It is expressed as a percentage of the total amount of water that could be held by the air at a certain temperature. Warm air can hold much more moisture than cold air. As an example, if hot and cold air had both the same amount of Absolute Humidity, the Relative Humidity (percentage) of the cold air would be far greater. What happens if the humidity levels in my grow rise too high or drop too low? Too much of either one, if not dealt with immediately, pose a great risk to your plants’ health. On one hand, if the humidity is very high, your plants won’t be able to breathe correctly, hence they will trap the water inside, meaning that they will not absorb any water through their roots and therefore no nutrients. Not only that, but you will also most likely start to find some sort of fungus on your plants, such as mold or mildew. On the other hand, if the humidity is low, essentially dry, your plants will close their stomata, through which they breath and transpire, in order to conserve some water, but after some time in such conditions, they will inevitably die. If the soil is not as dry as the air, the plants will pull much more water through the roots, meaning that they will intake loads of nutrients as well, which could cause a nutrient burn. 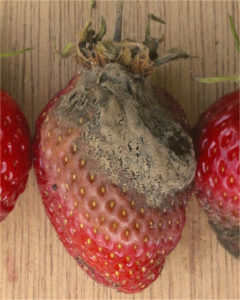 -If the plant is not of fruiting or budding, spray it with fungicide in order to get rid of mold, and avoid its return. -In the event of being an edible plant, a plant of fruits, or even a smokable plant, and the mold having spread a considerable amount, we would advise you to throw it away completely, as mold is incredibly prejudicious to your health, and especially to your lungs in case of smokable plants. -Cut the leaves or branches affected. -Get some wet paper towels and gently wipe the mildew off your plants. The paper towels should always be wet, or the fungus won’t stick, and you will make them airborne, facilitating their propagation and making it much easier for you to breathe the fungus into your lungs. -Place it in a dry area. Outside, below the sun, is a good idea. -Keep the soil drier than normal. -Increase air ventilation and turn the dehumidifier on. Mold or mildew don’t thrive in either dry or well-ventilated spaces. -There are also some traditional methods that we have heard of, but never tried, such as the spraying of baking soda, garlic, milk or vinegar into the plants. Note, they must well diluted, or they could bring other negative effects. How to control the humidity in a growing area? There are many ways one can use in order to increase or decrease the humidity in a growing area. The most popular way is to use a humidifier (or a dehumidifier), as they do wonders for your grow. You can even automate them, meaning that whenever the humidity drops below (or rises above) a certain level that you previously determined, one of them will turn on and set the levels to the optimal value. Ventilation is also very important, not only for temperature control, but also for removing some of the moist air from your grow and bring in less humid air from outside. Good air-flow is a prime solution to fight fungus on your plants. A short-term solution, in case of your plants being too dry, is to spray them with warm water. Although this solution only lasts for about 15 minutes. Another effective way to increase the humidity of an area is to keep the plants close together, as plants transpire, and release moisture into the air. In case of trying to decrease the humidity, do the opposite, simply spread them, and you should see a reduction and you should also cover your water tanks in order to avoid water evaporation. Ideal humidity levels are dependent on many factors, especially on the type of plant you want to grow, although most plants thrive in humid environments. The prime humidity for the average plant would be between 40 and 60%. A little higher during the vegetative stage of growth because plants need more moisture so that they can grow stronger. Remember: If you are cloning a plant, the humidity in its area must be pretty high (around 70-80%), because as clones don’t have roots, their only way of absorbing moisture and nutrients is through their leaves. Each crop and stage of growth has its own ideal humidity levels depending on many factors, and that’s where GroLab™ comes in handy. 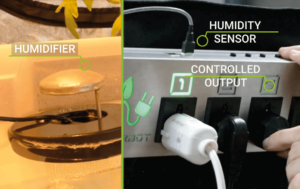 By automating the humidity values, you are guaranteeing that your grow won’t ever see any traces of mold or mildew, and the air will always be in the exact perfect conditions for your grow to thrive and give you the best yield. In this GroLab™ Automation video we explore the automatic rise of humidity in your grow, for that we are using the GroLab™ Starter Kit, with a ultra sonic mist creator as an humidity source for our room. This setup is quite easy to achieve and it will ensure that the humidity of your grow does not fall below to unwanted levels. On the GroLab™ software side this is achieved with the creation of a simple alarm. 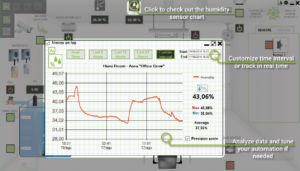 As you can see in the example shown in the video, whenever the humidity drops below 40%, the system will turn the humidifier on until the humidity levels are above 60%. 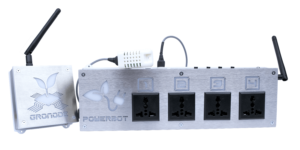 If your task was to instead to lower your humidity, you could use the ventilation of your room as first resource, and if that is still not enough, you can easily add a humidifier to PowerBot to improve the humidity removal of your growing area. With GroLab™ software, you can log all the data for your grow from seed to harvest, check the graph to see if your automation is meeting the demand, and fine tune your configurations in order to achieve the desired chart for your parameters, in this case humidity. In three small videos, we showed you how to control your lights, manage your grow temperature, and ensure the best levels of humidity inside your growing environment, all of this using the GroLab™ StarterKit from Open Grow™. On the next post we’ll talk about irrigation, a bit about of the most common irrigation systems, and how you can control them also with the GroLab™ Starter Kit, so stay tuned! If you have any questions or suggestions do not hesitate to comment, or if you need a more individual assistance, message us by using our contact form or send us an e-mail to info@opengrow.pt, we will be happy to answer you.